Not your average math games! 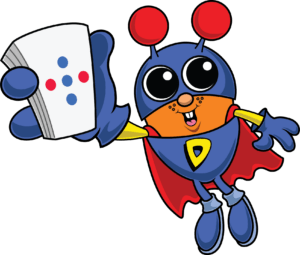 Our subitizing superhero, Dotson, is back! 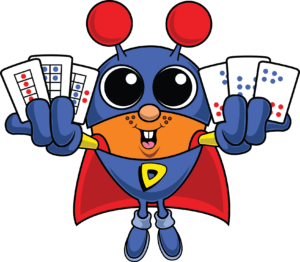 He brings you 8 new math games to play with your Deck o’ Dots! 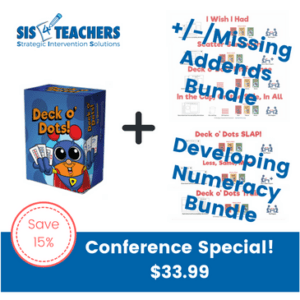 Appropriate for preschool through 3rd grade, these games will promote authentic numeracy development, increase communicative reasoning, and quickly become your students’ new favorites! 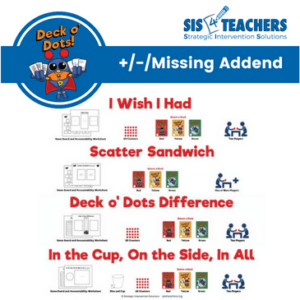 Deck o’ Dots are specifically designed without digits to help children subitize (instantly recognize number quantity) in order to develop higher order thinking skills in mathematics. This deck of cards contains three distinct levels marked by different colors for simple and subtle differentiation that meets the needs of all learners. Our time in the classroom is precious and we want every second to count! 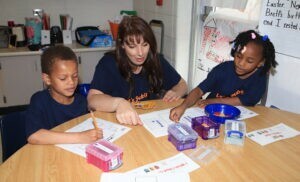 At Strategic Intervention Solutions, we believe in quality math games that focus on helping students cultivate rich mathematical thinking as they play. Every math game we develop or promote must align with our 5 Golden Rules. 7 of the 8 Mathematical Practices. Easy differentiation options. The game should be adjustable for ALL learners. Low preparation. The game should require minimal pieces/copies/hours to set up. Accountability. Students should be able to demonstrate their learning. Longevity. Students should be able to play it for 2-3 weeks for maximum impact on learning. Deck o’ Dots Games meet all 5! 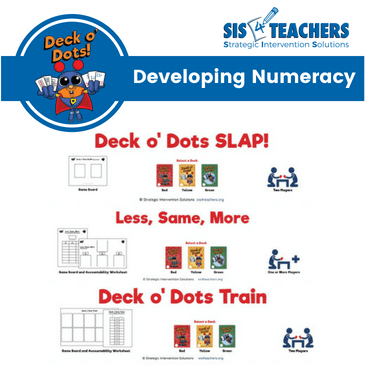 Deck o’ Dots games help students develop the confidence, vocabulary and strategies to be able to communicate the reasoning behind their answer and to really understand what happens behind the scenes of our symbolic system of numbers by recognizing patterns and making connections. In order to help teachers increase the complexity of the games students are playing, each game includes both a regular version and at least one challenge version (some have more!). Each version of the game can be played with any of the four differentiated Deck o’ Dots decks, meaning there are at least eight different ways to play! 8 variations x 8 games = over 64 different ways to play! Order all 8 games for hours of fun! Keep reading to find out how this game can be yours for free! While our new game boards and accountability sheets are fun and feature the vibrant Dotson character, they aren’t fancy. Print them in color or black and white, on cardstock or regular copy paper, laminate or don’t laminate – it doesn’t matter! The game boards simply provide a guide to help students remember what they’re doing and stay organized, but the focus is on actually playing the game! Instead of just flying through games or going through the motions, students must understand why they’re doing what they’re doing and record something that demonstrates that understanding. 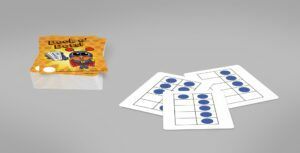 Each game includes an accountability sheet, which becomes as much a part of the game as any other manipulative, to help students tie the quantities they’re looking at to actual digits and symbols. This transition helps students develop the language they need to be able to talk about and be flexible with numbers, which comes from a proper development of numeracy that is not forced or memorized. What’s included in each game? Title Cards. These colorful pages help your students develop independence by showing them exactly what they need to play the game with both words and pictures. Detailed Instructions. 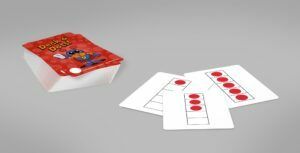 Written for the teacher, but with the student players in mind, the instructions include the focus of the game, a materials list, step-by-step instructions, example situations to illustrate game play, explanation of the accountability sheet, and explanation of challenge (or differentiation) options. Click to the tabs to find out which bundle is best for you! 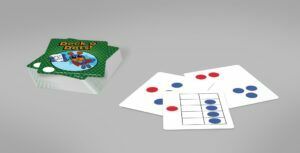 This series of games is designed to help children learn to subitize, or instantly recognize number quantity without one-to-one counting ,and reinforce number conservation, the recognition that quantity does not change with physical rearrangement. This series of games helps students build on their foundation of conservation. Students will learn to play with adding and subtracting and missing addends, not using real digits but using their understanding of the structure of our number system. The accountability sheets in this series are designed to help students relate their learning to In the accountability sheets, relating it to learning the numbers and operation standards, but not through the symbolic or abstract. Buy all 7 games for $19.99 – 10% savings! 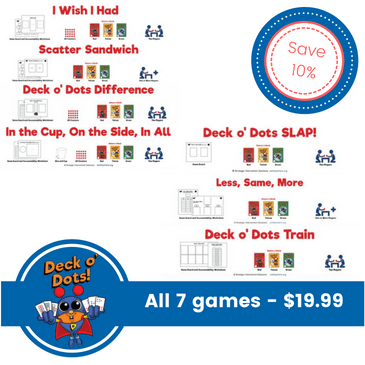 Click the link to download your free Deck o’ Dots Game! Your first game is FREE! SIS4Teachers delivers practical, research-based, ready-to-implement ideas for 21st century math instruction that you can use in the classroom tomorrow. 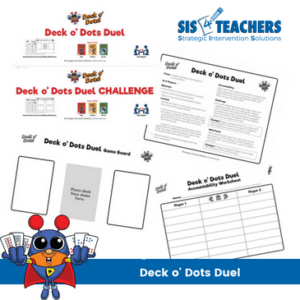 Sign up to receive updates via email and get a free instant download of your first Deck o’ Dots game! Sign up to receive updates via email and download your first Deck o’ Dots game for free! After subscribing, you will be redirected to a password-protected download page - check your email for the password! Thanks for subscribing! Check your email for the link and password!